Professional tooth whitening is a safe way to whiten the overall appearance of teeth. Professionally made custom trays help achieve optimal results. Tooth whitening is a chemical process that whitens the tooth structure from the inside out. Peroxide in the whitening gel moves into the tooth structure where it breaks down molecules that cause discoloration. The whitening gel lightens the entire tooth even if the entire tooth is not covered in whitening gel. Fortunately the whitening process does not break down the structure of the tooth. The whitening gel simply lightens the color of the tooth. Additionally, the gel lightens only the natural portion of the teeth. Whitening gel does not change the color of fillings or crowns. 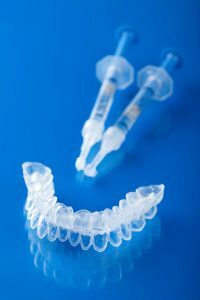 Custom fit whitening trays are the best way to ensure optimal whitening results. An assistant takes impressions of both the top and bottom teeth. We fabricate custom fit trays for each individual in about a week. Patients return to the office to make sure the whitening trays fit properly and we review instructions for using the whitening gel. Tooth sensitivity is a common side effect of whitening. Fortunately this sensitivity is temporary and should not last after whitening is completed. Most whitening gels we offer at Adams and Cheek Dentistry are available with desensitizing agents to help reduce sensitivity. Rarely does a patient return to the initial shade prior to whitening. Nutrition and lifestyle habits can play a role in how long the whitening effects last. For optimal results, we recommend patients touch up whitening, by whitening once or twice, after cleanings. However, not all patients require whitening touch ups after every cleaning. Adams and Cheek Dentistry is running a Valentine’s Whitening Special! Contact our office at http://raleighncdentistry.com/contact-our-office/ and book for whitening tray impressions by the end of day February 14, you will receive whitening trays and gel for half price!